Appreciation Has No Expiration Date | Champions 4 Christ Inc.
I’m amazed how we learn the art of desire at a very early age. As a baby we desire to be fed. When we feed babies you can see their appreciation by the sounds and looks they give as they eat. Then after a couple of hours the baby has forgotten about their last feeding and has no appreciation for the efforts made to feed them and then begin to cry out for another feeding. When we go and buy food or other perishable items we look primarily at two things, the price and the expiration date. In accounting courses we learn two key terms, FIFO (First-In First-Out) and LIFO (Last-In Last-Out). So, when I go and buy milk I go straight to the back where I know the expiration date has more time than the milk in the front. When it comes to wanting or desiring something many of us know that our appreciation can be vital to receiving what we want. We all have experienced wanting something so much that we may be willing to do anything to get it. However, once we get what we wanted, needed, begged for, or had to have many will become unappreciative of that which we couldn’t live without. Once, some years ago as the Christmas season was approaching our children was letting us know what they wanted for Christmas. Then my wife asked them to tell us about the gifts from the previous year for Christmas. Not only did they not know where those gifts were but they couldn’t remember what they were. We knew what we gave them and had an idea where they were. We considered rewrapping their old gifts and giving it to them again due to their lack of appreciation of our efforts to provide their gifts.. Unfortunately, too many of us act as though appreciation has an expiration date. After the Christmas season, the gifts are no longer appreciated as if the gift expired. After the first couple of years of marriage some act as if their appreciation for one another has expired. After God has blessed us with gift upon gift when circumstances and situations come our way we act as though we have no appreciation for what God has already done. 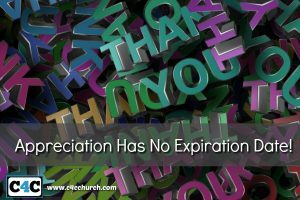 Therefore, don’t let your appreciation expire. I have learned and I encourage to practice the following appreciative principles. In everything give thanks; for this is the will of God in Christ Jesus for you. Give Thanks With A Grateful Heart and I will bless the Lord at all times; His praise shall continually be in my mouth. My soul shall make its boast in the Lord; The humble shall hear of it and be glad.